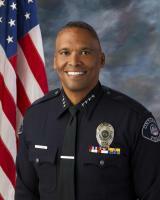 Chief Derek Williams began his law enforcement career in 1991 with the Ontario Police Department. Before becoming a police officer, he was honorably discharged from the United States Air Force. 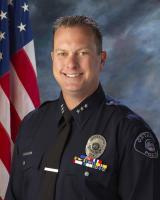 Chief Williams has an Associate's Degree from San Bernardino Valley College and a Bachelor's Degree from California Baptist University. After graduating from the 103rd class of the San Bernardino County Sheriff's Academy, Chief Williams worked as a Patrol Officer. He was later selected to start the Bicycle Program at the Ontario Police Department. During his career, Chief Williams worked many assignments; he was assigned to Narcotics as an Officer and Detective, assigned to the Ontario Mills Mall, worked as a Field Training Officer, was a member of the department's SWAT Team, and supervised the Personnel and Training Division. Before being promoted to Chief, he was the Deputy Chief of Police. In December 2010, Chief Williams graduated from the Los Angeles Police Department Leadership Program, formally known as The West Point Leadership Program. In 2016 he also became a graduate of class 263 from the FBI National Academy. Deputy Chief Mike Lorenz graduated from West Covina High School and has a Bachelor of Science Degree in Criminal Justice from California Coast University. He served in the United States Air Force from July 1993 - June 1997. In late 1997, he attended the 130th basic training academy at the San Bernardino Sheriff's Academy. He was hired during the academy by the City of Ontario and in March of 1998 became a patrol officer. Deputy Chief Lorenz worked a variety of assignments to include; Patrol, Narcotics, Gang Violence Suppression Unit, Field Training Program, Multi-Enforcement Team and SWAT. He spent four years as a task force officer with the DOJ/BNE clandestine laboratory team, where he targeted methamphetamine and PCP labs. In 2017, he graduated from the inaugural Cal Chiefs/Drucker's Institute of Executive Leadership Course in Claremont, Ca. Deputy Chief Lorenz has held supervisory and command positions in: Patrol Operations, East Area Command, SWAT/Crisis Negotiations. COPS/MET, Gang Suppression Unit, K9 and Interdiction.